Earlier this week, a letter was circulating around the internet from a man named Thaer Halahleh. He had, at the time of its publication, been 75 days without food. The letter was written to his two-year-old daughter, Lamar, whom he had never met. Thaer Halahleh is one of between 1500 and 2000 prisoners in Israeli prisons who have been engaging in hunger strikes. Reports suggest most of the protesters are Palestinian. Halahleh and another man, Bilal Diab, have been fasting since 29 February to protest the injustice of being placed in administrative detention – arrested and locked up without charge or trial for months, sometimes years. The practice of administrative detention has its roots in the British Mandate of Palestine, allowing ‘evidence’ to be kept secret indefinitely from the detainee and their legal counsel, as well as the public, ostensibly for security reasons. Many of the prisoners are denied visitors, clean clothing and kept in solitary confinement. Quite apart from the fact that political prisoners can be treated so unjustly, then refuse food for over two months and it doesn’t even make a dint in our local media, I find those figures difficult to process – not to believe, but to comprehend in a meaningful way. 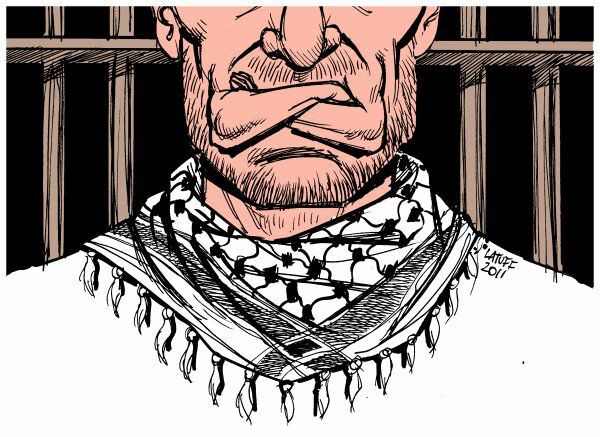 2000 prisoners on hunger strike. Two thousand. 77 days for some of them, starving. In a way, such numbers are tricky – simultaneously easy and cruel. They encourage abstraction and personal disconnection. They suggest formulas and mechanics. They alienate and obscure the physical reality of suffering as it manifests for each individual. When a person starves, their skin becomes sore and irritated. Infection sets in easily. Muscle atrophy means even the smallest movements hurt. Talking and swallowing require excessive effort and are often accompanied by further pain. When Bilal was finally taken to the hospital to be treated, he was shackled by his wrists and ankles to the bed. Perhaps it’s easier to dismiss, to ignore, to get on with everyday life by processing the effects of abuse and injustice in terms of numbers. Numbers encourage us to think about these things as far away, as not only removed from ourselves but removed, in a way, from the body – from physical sensation and the emotions inextricable from that. Politics as mechanics, politics as abstraction. Yet a hunger strike is so visceral, so intimate. And, in a way, it’s a transformation – a wilful reclamation of the body from being a site of violation to a manifestation of resistance. That kind of courage, that kind of conviction, is as awe-inspiring as the kinds of acts to which it responds are cruel and abhorrent. News reports are claiming the strike is over and a deal has been struck. What it will actually mean for the prisoners is unclear. But I keep thinking of that letter Halahleh wrote to his daughter. ‘The battle of freedom is the battle of going back to you,’ he said. Multiply that by 2000. I saw a couple of tweets the other day complaining (read: threatening unfollow) about how those expressing solidarity with the hunger strikers were ignoring the fact that people of all nationalities face the threat of administrative detention in Israel, not just Palestinians. Which is technically true. But what a point to nitpick over! As if it wasn’t manifestly obvious that such a law would be used against Palestinians more than anyone else (it is) or that there wasn’t evidence conditions for those prisoners is far worse than for those of any other nationality. Thankyou Stephanie. I found this post very moving, as was Halahleh’s letter (‘this is our destiny as Palestinian people to have our lives and the lives of our children taken away from us’!). The way you describe the potential power of the (abject) body, when that is all that is left to fight with – ‘a wilful reclamation of the body from being a site of violation to a manifestation of resistance’ – reminds me of Steve McQueen’s Hunger . I don’t know if you’ve seen it but it’s been on my mind, because of Halahleh and Bilal and the two thousand plus, and because of the anniversary on 5 May of the death of hunger striker Bobby Sands. Apparently you can watch the whole film on YouTube. I haven’t seen ‘Hunger’ but I’ll put it on my list.